Note: A minimum quantity of 20 must be ordered, and in units of 2 thereafter. Verbatim MediDisc Recordable CD Media - MediDisc CD-R offers write-once storage capacity of 800MB/80 minutes and a recording speed of 52X. Printable discs offer high speed/high performance Super Azo Dye technology. Special manufacturing and testing control procedures ensure disc-to-disc consistency. Protective scuff-resistant coating protects data DICOM compliant and usable in HIPPA records systems. 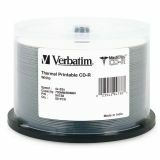 Unique disc label design can be printed on with a soft tip pen or various CD/DVD disc printers. Archival life exceeds 50 years.